Is this the twilight of Chase Utley's superb career? The Reds begin a three-game set in Philadelphia tomorrow night. May was a rough month for the Reds, but at least they ended it on a high note: a 3-game sweep against a very good Washington Nationals team. It was an odd series in a variety of ways, but at least it was nice to see the Reds' offense come alive. I found myself repeatedly marveling at how much fun it is to see the bases full of Reds, and then to see them running around the diamond with yet another clutch hit. It was a great series. I'm still feeling like a bit of a Negative Nelly about the Reds overall, however. Their underlying numbers weren't very strong before the Losing Streak from Hell, and they obviously got a lot worse as a result of being beat up for almost two weeks. Some of the excellent results they've gotten from their young starters have not been backed up by good peripherals. Doom and gloom. But hey, at least they're not the Phillies, right? 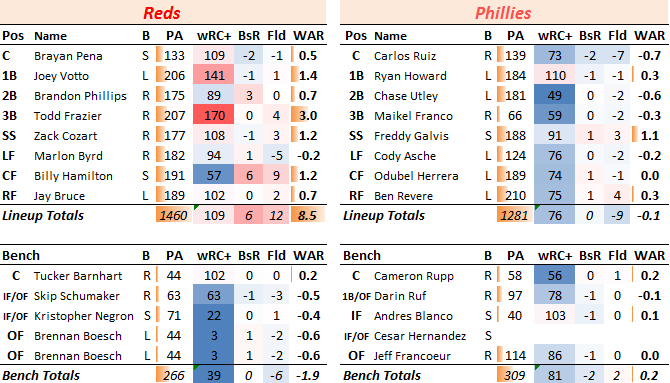 Last year, I wrote a little bit about how the Phillies were a bad-case future for the Reds. They were saddled with some tough contracts, they're aging, and their young talent either hasn't materialized or is still far away. That's still a pretty good description of their plight: they can't hit, can't field, and can't pitch. I do tend to think that a change in their front office might be warranted at this point. Maybe they're just waiting to see what Amaro can do with Cole Hamels, who is the last good trade chip. Surely they have to realize it's time to commit to a rebuild, right? It's a shame, because this team was so good just a few years ago. Did you know? The 2011 Phillies posted the fourth-highest pitching staff fWAR of any team in MLB history, behind only the 1996 & 1997 Braves and the 2003 Yankees? Man, those Braves teams were really good. The biggest shock here is unquestionably the crater that has been Chase Utley. I watched a game earlier this season, I think it was Phillies vs. Mets, in which Utley was wreaking his usual havoc; getting on base, driving in runs, being dominant and awesome, etc. Apparently, that's about the only game in which he did that this season. Utley hasn't posted a sub-3 WAR season since 2004, but one has to wonder if, at 36 years old, the knees and body are finally failing. He's long been among my favorite players, and it's sad to see him struggle so much. Similarly, though less spectacularly, are the struggles of the offense-first catcher, Carlos Ruiz, who gets buried by framing statistics and can't seem to hit any longer. A few weeks ago, Ryan Howard was being talked about as a possible trade candidate if the Phillies could find someone to take on his contract in a salary dump-style deal. He's been tapering off a bit, though, and I wonder if that's still realistic. He's only under contract for another year. The interesting rookie here is Maikel Franco. In the minors, the 22-year old third baseman has shown good power and good contact rates, but rather poor patience. Kiley McDaniel has him as a 55 future value prospect, again noting good power, good bat control, but poor plate discipline. So far, that combination hasn't worked for him. Finally: holy crap, Todd Frazier! He has been ridiculous this season. The home run he hit Sunday was "only" the 3rd-longest of the day (419 feet) and was rated at "just" 104 mph, but to my eye it was crushed as hard as any ball I've seen this season. And while part of me cringes on the inside, I can't help but grin every time he lunges for a ball low and outside and somehow still drills it to right field. The big story, obviously, will be Johnny Cueto's return for game 1. While I don't hold much hope for the Reds' playoff dreams this season, Cueto's performance over the coming month figures prominently in their future seasons: he's their most obvious trade chip, and a healthy Cueto could be a huge boost to almost any playoff contender. Jocketty needs to play this right. Mike Leake is another important trade chip, and I'd love to see him get back on track with a nice outing against a weak-hitting Phillies offense. He really needs to pitch well enough to be worth trading, because I see him as the kind of player who will see his value get killed if he becomes a compensation pick free agent. ...I hate to be the downer, but as much as I enjoy Anthony DeSclafani, and as much as I cheer him on, I'm not feeling particularly encouraged by his most recent couple of starts. He's just not doing anything well save for having a good BABIP. I still think he can be a good back-end starter, but he's not showing that level of performance yet. Sean O'Sullivan's line is kind of interesting as a sort of poor-man's Mike Leake. There's not much in his track record that indicates he can sustain even this level of success, however. I continue to be a big believer in Jumbo Diaz, despite the ERA. Love his velocity, love his strikeouts, love his lack of walks. It just seems like he has been missing in bad places this season, and those misses have been crushed. Also, Ryan Mattheus has been pretty impressive since joining the team, no? I wonder how much of a trade chip Jonathan Papelbon is for the Phillies. He's certainly been pitching like an elite closer this season, and has a bit of an "aura" still. Here's hoping the Reds can have a nice series against a very weak club. I'm at that point that I'm already more focused on individual performances than the team's, but three of the Reds' biggest trade chips are pitchers (Cueto, Leake, and Chapman), and this could be a good series for all three. While I don't think the Reds need to blow up the entire team, I do think they need to do everything they can to improve the 2016 team without regard for this year. A strong June by those three would help quite a bit.